In our last chart quality investigation we looked at the fine detail of transmissive (backlit) test charts. Now we will look in to the properties of reflective charts. Imatest currently offers three types of reflectively-illuminated test chart. Most of the charts we produce are printed on a high quality inkjet printer on matte or semi-gloss (luster) papers. We also have a chart that is produced with a photographic process. 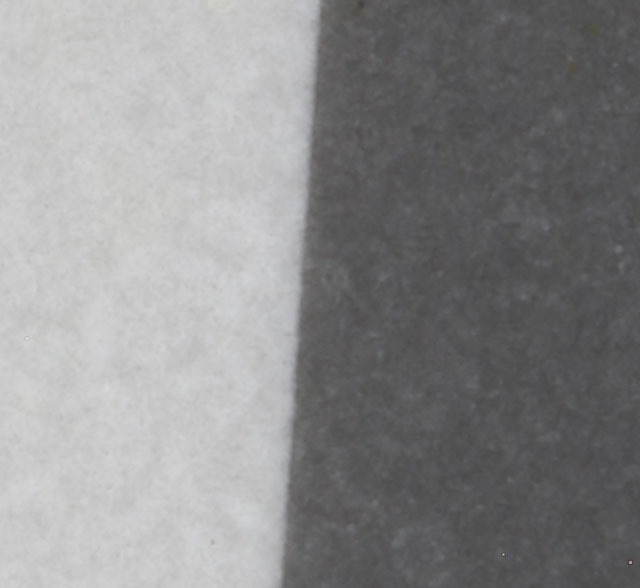 We will determine which of these substrates has the sharpest edge and quantify the difference. Chart suitability displays for several common media types, measured with 4:1 contrast charts, are shown in Test chart suitability for MTF measurements. You can use these displays to predict test chart suitability without running Imatest. 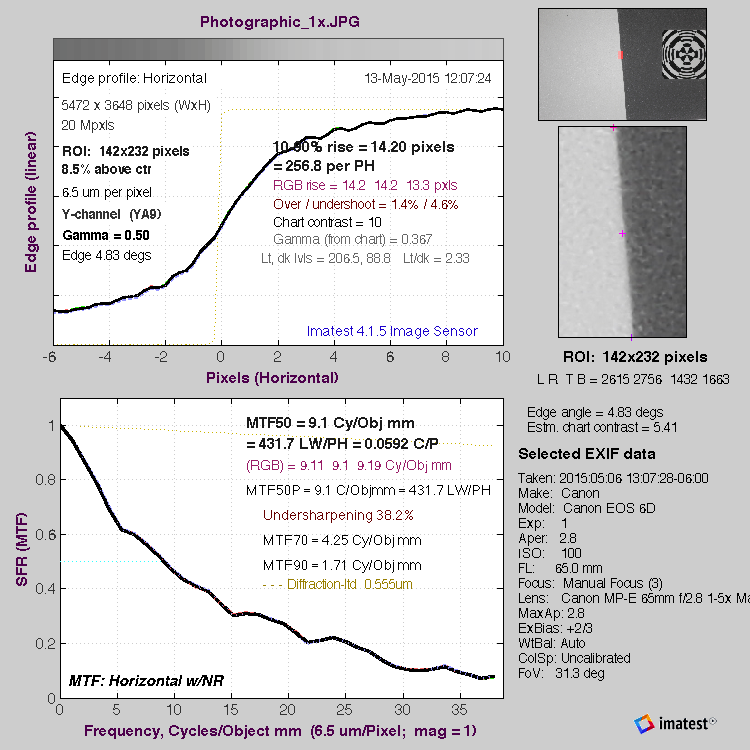 The below 10:1 contrast ratio SFRplus test chart is printed at 600 ppi (pixels per inch) on Epson Enhanced Matte Paper using an HP DesignJet Z3100 printer. We can produce charts on this material at sizes up to 1083mm (44 inches) in height. 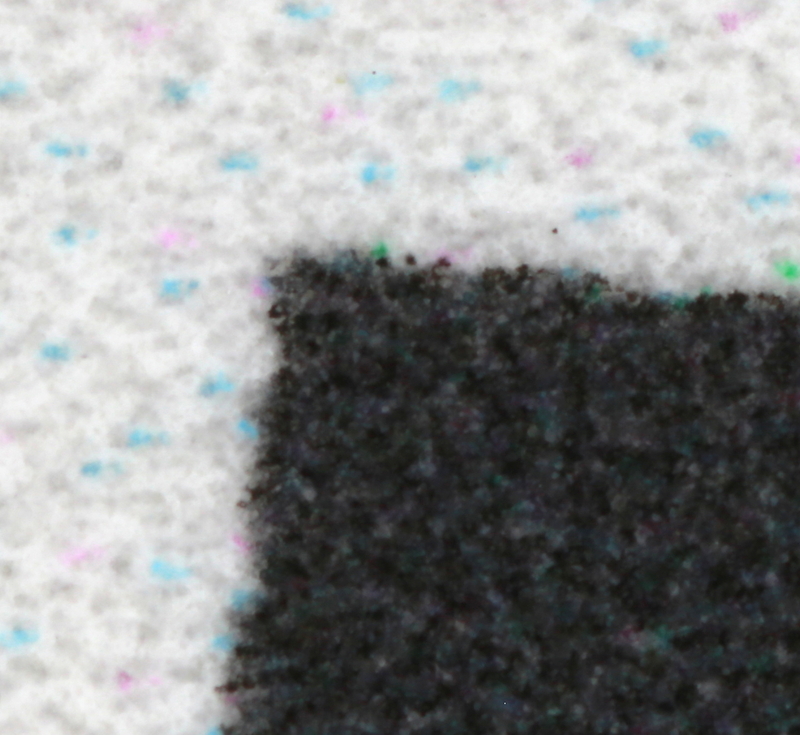 Please note that the cyan and magenta dots are added to the grey in order to adjust for the white point of the matte paper which is slight warmer than the other substrates. This photographic eSFR ISO test charts are produced using a chemical photographic process, up to a size of 800mm x 1220mm (31.5″x48″) This process is black and white but we can attach profiled color patches for an additional fee. These charts were illuminated using a circular LED Desk Lamp, fashioned as a ring light around the lens. They have been photographed using a Canon EOS 6D camera, which has a pixel pitch of 6.5 microns, using a Canon 65mm f/2.8 1-5x macro lens, manually focused with magnification set at 1:1. For each chart a series of images was taken at three different apertures, f/4, f/5.6, f/8, and f/11. The sharpest image (which was always f/4) was selected from the set using the Find Sharpest Files module in Imatest. 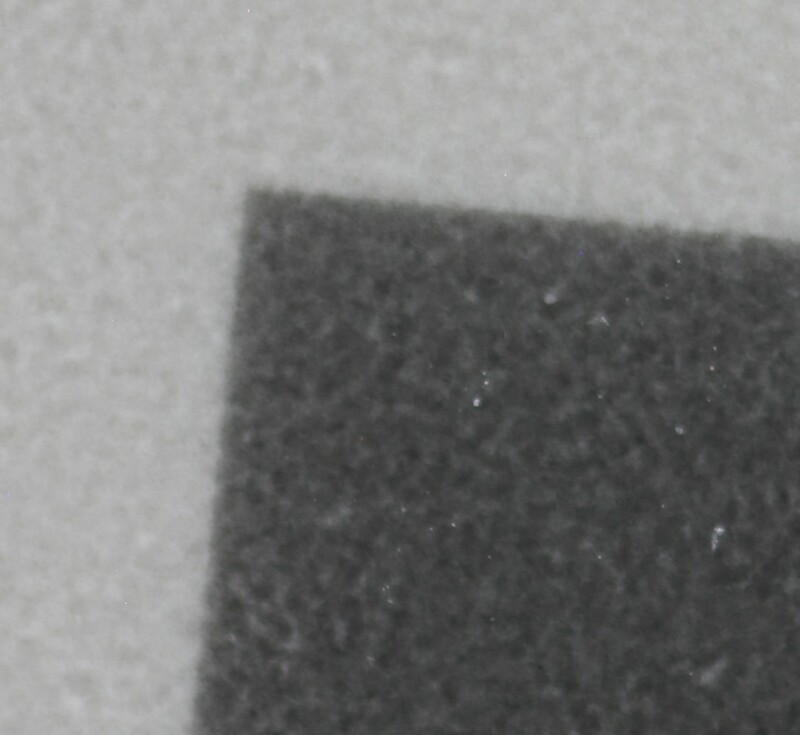 Images were also recorded at 4:1 magnification, however, the Inkjet prints were not of high enough resolution to produce a true result. 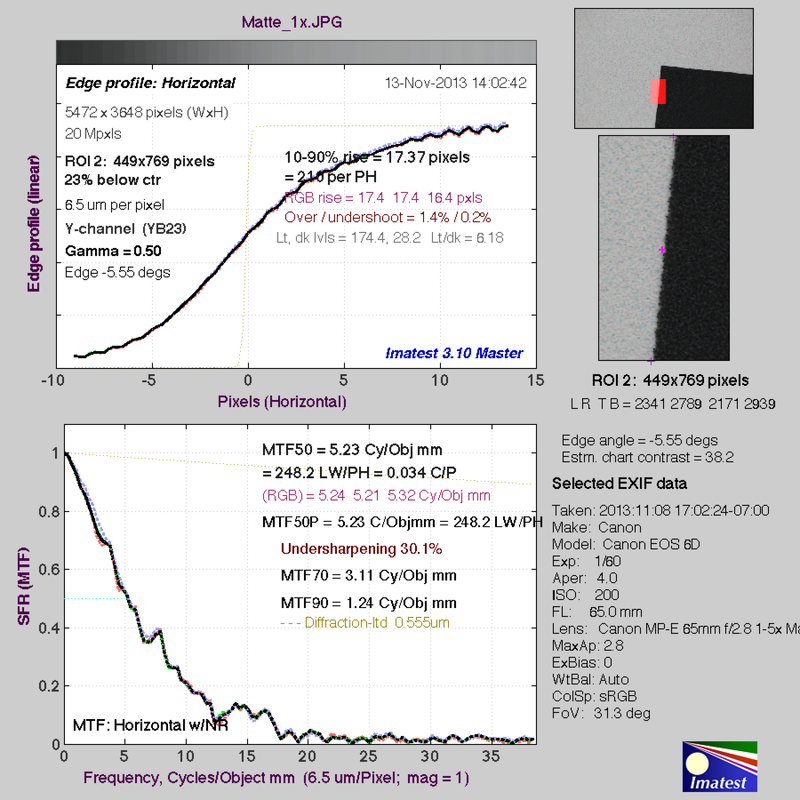 The MTF was measured in cycles per object mm using the SFR module of Imatest. 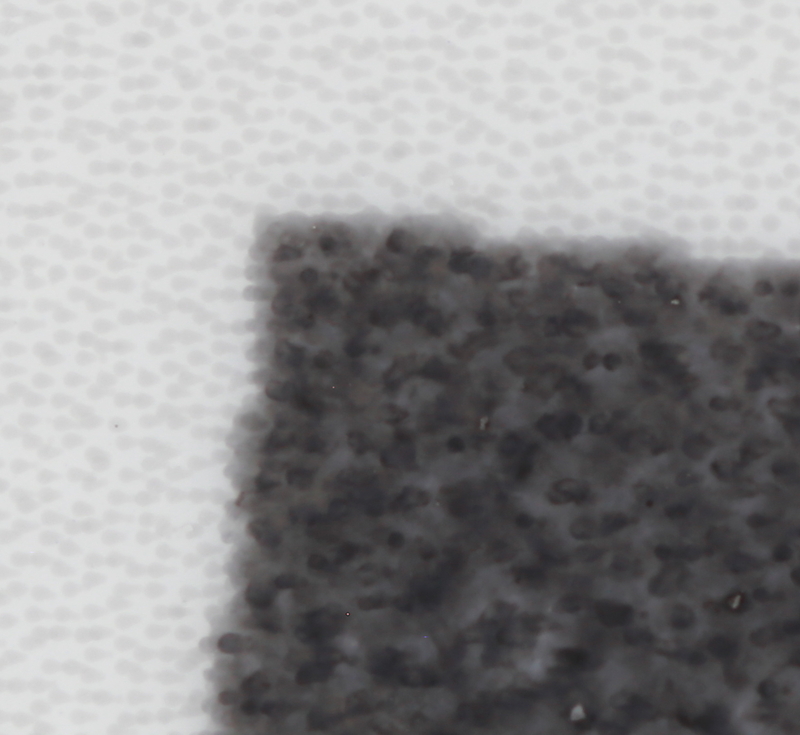 While the rez checker provides the highest precision reflective process available, the test area is very small so it is not ideal for mapping out sharpness across the entire sensor. The photographic print is the highest resolution option available for a large reflective chart. 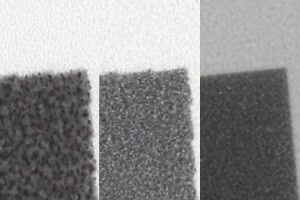 Over a 2D area, the photographic process is roughly 2.2 times the sharpness of the inkjet prints. 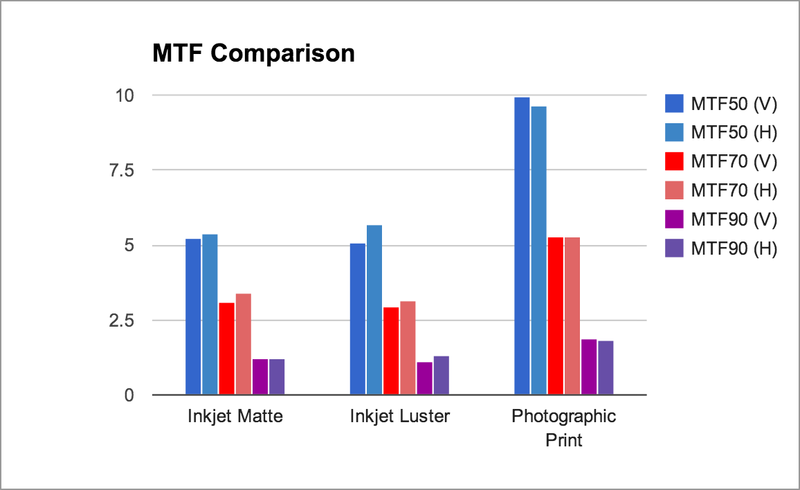 For the inkjet charts, while the luster surface holds a slight advantage over the matte surface, the two options are very close to each other in edge sharpness. Transmissive targets can be produced with significantly more detail than reflective surfaces. The main advantage of the reflective prints are the ability to produce them at lower cost and at larger sizes. This entry was posted in Test Setup and tagged Chart Quality, Inkjet, Photographic, Reflective, Test Charts.